Deep fried dough; it's that delightfully evil combination of carbs, sugar and oil. Usually I am very controlled with my doughnut intake. As delicious as they are, the amount of guilt that comes with consuming all that heavy deep-fried carbness always outweighs the positives. 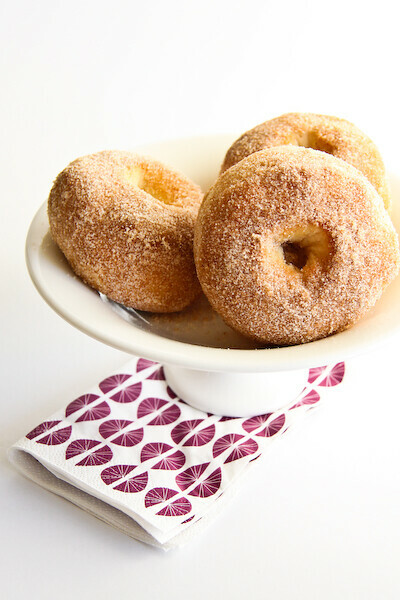 So when I came across this baked cinnamon doughnut recipe, I had to give it a go. 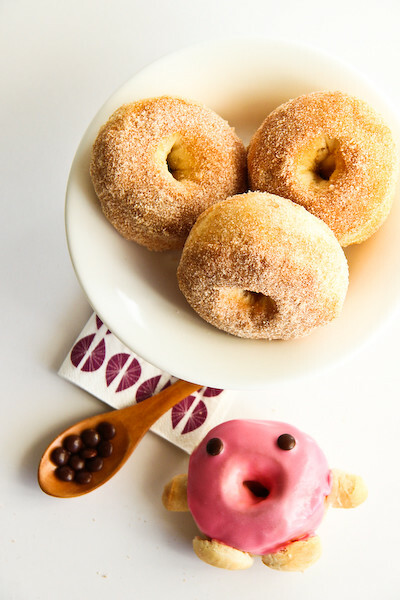 Would it satisfy my doughnut cravings without the guilt and the hassle of deep-frying at home? The answer was undoubtably YES. Obviously they are not exactly the same in texture, baking will not completely recreate the golden exterior doughnut that deep-frying does. The flavour was spot on with that lovely crunchy cinnamon sugar coating on the outside and the super fluffy innards. After the doughnuts had cooled they were quite hard on the outside, but a quick 10-20 second zap in the microwave turned them super soft and super doughnut-like. If anything I would suggest keeping them in the fridge overnight and then zapping them in the microwave before serving because it gives them that perfect soft texture. Do you like the little pink doughnut dude? Those of you in Australia might recognise him from the Extra gum commercial with all the animated food running around (not sure if they've used this ad in other countries). I loved the doughnut in this ad when it first came out, but he's been a bit overused since. Since it was my first time making doughnuts, I couldn't resist recreating this little fella. Isn't he adorable? He's covered with a thick strawberry icing, mini M&M eyes and his arms and legs are made from chopped up doughnut holes stuck in with toothpicks. The toothpicks are a little bit of a choking hazard, so if you wanna make these guys to serve you might want to think of a safer way of attaching the arms and legs. But isn't he adorable?! Speaking of the doughnut holes, they were just as great to eat as the regular doughnuts. For those who can't be bothered making doughnut shapes or would prefer to portion control and only have little doughnuts, just use the smaller cutter to make lots of these little doughnut holes. I couldn't stop popping these little babies into my mouth while I was pottering around the kitchen! Place milk in a heatproof, microwave-safe jug. Microwave on medium-high (75%) for 30 to 40 seconds or until heated through (do not allow to boil). Stir in melted butter and set aside. Sift flour into a large mixing bowl. Stir in yeast, sugar and cinnamon. Make a well in the centre. Add milk mixture. Mix to form a soft dough. Turn out onto a lightly floured surface. Knead for 10 minutes or until smooth and elastic (or if you are lucky enough to have a mixer with dough hooks like me, beat using dough hooks on high for 5-7 mins). Place dough in a lightly oiled bowl. Cover with plastic wrap. Set aside in a warm place for 1 hour or until doubled in size. Line 2 baking trays with baking paper. Using your fist, punch dough down. Turn out onto a lightly floured surface. Knead until smooth. Roll dough out until 2cm thick. Using a 6.5cm cutter, cut 12 rounds from dough. Using a 3cm cutter, cut circles from the centre of each round. Place doughnuts (and doughnut holes), 5cm apart, on prepared tray. Cover with lightly greased plastic wrap. Set aside in a warm place for 30 minutes or until doubled in size. Meanwhile, preheat oven to 180°C. 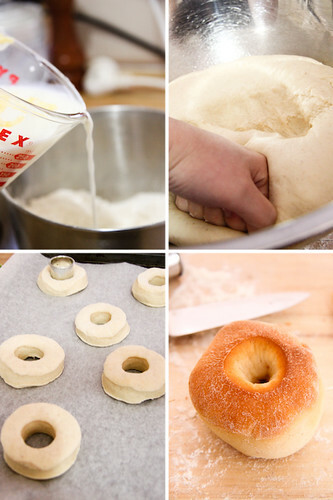 Cook doughnuts for 10 to 12 minutes or until golden brown and cooked through. 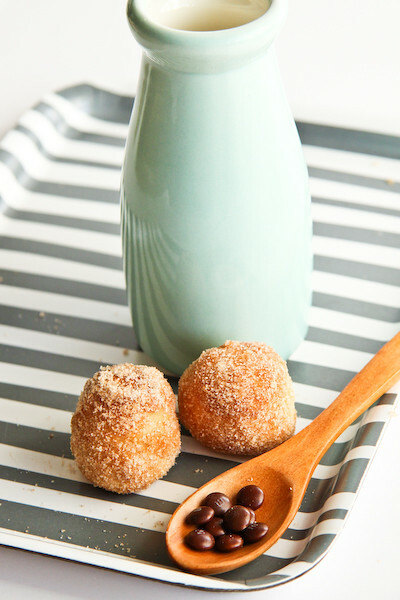 For cinnamon doughnuts combine sugar and cinnamon in a bowl. Brush doughnuts with remaining butter. Dip in sugar mixture, shaking off excess. If you can be bothered making the little doughnut dudes, sift icing sugar in a bowl and add strawberry essence and food colouring. 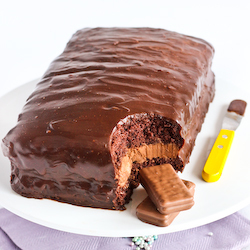 Gradually stir in milk, 1 tsp at a time until the icing is smooth and thick and does not flow too quickly. Dip one side of the doughnuts in the icing and place on a wire rack to set. 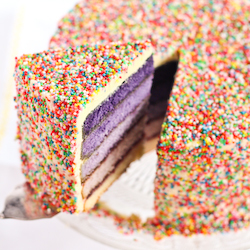 If you icing is too runny either add more icing sugar or chill it until it is the right consistency. Before the icing is completely set on the doughnuts, place m&m 'eyes' on them. Using the doughnut holes, slice these up using a sharp knife and insert toothpicks into them and attach to doughnut to form arms and legs. Serve doughnuts while still warm, or can be stored in an airtight container in the fridge and warmed up in the microwave for 10-20 seconds before serving. Avoid serving cold. Ahhhhh Mr Doughnut Man why are you so adorable! Did you end up eating him..? Awesome work with the doughnuts - mmmm yummy photography! nawww Mr Donut Man, oh how I love you :D Your donut man is way cuter than the ad. Thanks for the healthy alternative! I have always wondered how baked stands up to deep fried - obviously, it does! squeeeee! like! like! cute overload! squeeeee! OMG i love that doughnut!! OMG! So freaking cute!! I love the doughnut man :) And those doughnut 'holes' are a great idea! 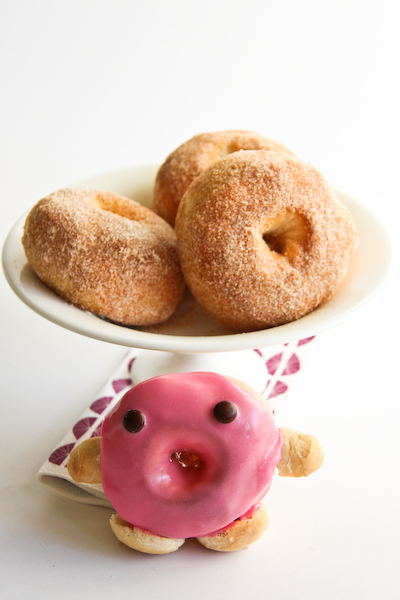 Donut Man is way cute, did his fate end up in your belly? oh so cute! i love the pic of him standing on the wooden spoon. and you should definitely eat him! with glee! Love these! Adorable post. I posted a link on my column (ediblecrafts.craftgossip.com). When I first saw the donut man I thought he was a little piggy, which was equally cute! 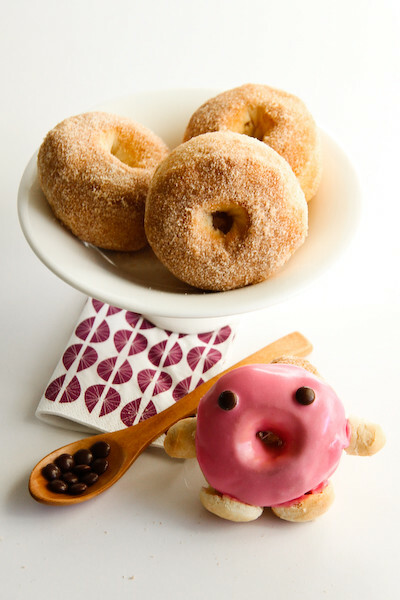 I've made these donuts in the past and they're so good, you've got me craving them again! 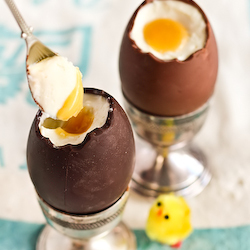 I can't wait to make these for a fall brunch party. They look so good! And I bet they taste just as good without the frying. omg lol the Doughnut man is soooo cute =D You are one talented baker steph! omigosh. he's adorable. this post made my LIFE! I used to squeal every time I saw that commercial. 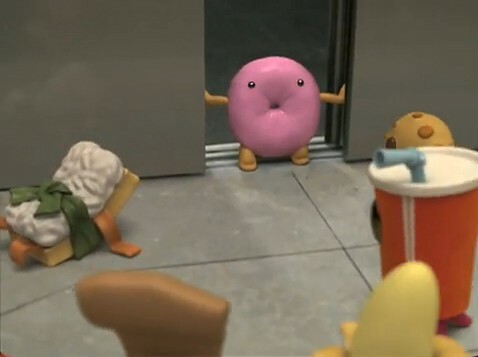 I would feel so bad eating that little doughnut guy though- I'd probably take a bite of him and apologize profusely. Very very cute. I keep coming across recipes for baked donuts and have been very skeptical. Might have to finally give it a go some day. Mmm been too long since my last cinnamony donut. I LOVED that ad! It was so so cute! Must try these. I've been wanting to make donuts for awhile. Bahaha I love the little doughnut dude! You've done a great job of making him ! Little doughnut dude is the best! I hope that you have eaten him though. He'll be sad if you don't. He wants you to eat him! He'll make your insides happy and pink! Delicious organic fresh doughnuts at the footy have rekindled my love for doughnut action (I'm not normally too keen) so it's quite fortuitous that you should post this recipe now. Perhaps I will have happy and pink insides soon too. Hehe, your replica donut dude is...delicious! Love the baked donuts, too. Love the little doughnut guy!! Donuts are my weakness....but this is a fantastic alternative to the bad deep fried version. Oooo must try it some time. 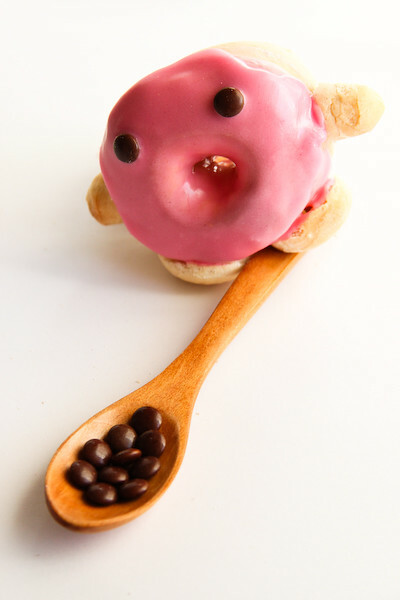 And I love your donut man he is way too cute to eat! Margaret Tran - Haha of course! He was strawberry-licious :D Thanks! Iron Chef Shellie - :) Thanks so much! Good luck with the recipe, it's super easy! mademoiselle délicieuse - Aww yeah I love the banana too! Phuoc'n Delicious - Hehehe thanks! Cinnamon sugar is so addictive! Helen (Grab Your Fork) - Hahaha same! He reminds me of domo-kun there. The eating was definitely gleeful! Megan - Ooh I hope they turn out well for you! Anh - :D thank you! Ellie (Almost Bourdain) - Haha I know, but I was so lazy! Celeste @ Berrytravels - Same here! Try it try it! Conor @ Hold the Beef - Heehee thanks! oh i definitely ate him! He was so good, I wish I had made more! ooh organic fresh doughnuts sound awesome! hurrah for happy pink insides! Megan - Thanks so much! Rhonda (thedaintybaker) - Same here, deep-frying makes such a mess! Brenda - they are such a guilty pleasure. this way it's slightly less guilty!thanks! 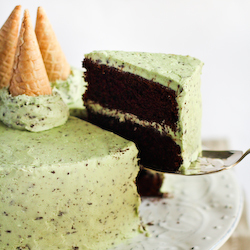 You are fast becoming one of my favourite bloggers! Everything...I MEAN EVERYTHING! you make is too cute! B. - Aww yay! :D Glad you're enjoying everything! I've done these twice and they are so, so, sooooo great! They taste almost like the real thing, their texture is lovely and they are so easy. You are my favourite blogger!! !